Today’s Flash Back Friday comes from Episode 187, originally published in November 2013. On this episode, Jason talks with anti-virus software expert John McAfee. 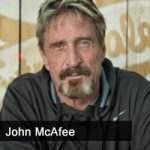 John started the famous McAfee anti-virus computer software, which helps block viruses.